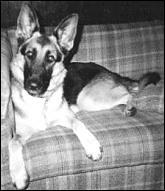 Christy, my German Shepherd, has had two major life threatening traumas in her eleven years on this planet. About four years ago after dinner, which was always holistic dog food, she became very sluggish and lethargic. I was working with clients and not aware of this immediately. About three hours later, her stomach was very distended and she could hardly get onto the couch. My husband and I did not know what it was, but at midnight, unable to reach our regular vet, we rushed her to the local animal hospital. The news was not good, twisted intestines, very common in Shepherds. The immediate prognosis was death. Panicking, we waited anxiously for the vet to x-ray her, not being able to since the machine was broken. We were not happy with his inappropriate usage of the English language as well as what we first believed to be his incompetence. He and his assistant rolled Christy on the floor from left to right while she was sedated. He told us her condition was critical but there was nothing he could do for her there. My husband carried Christy in his arms, no easy feat sine she was seventy-five pounds at that time. We laid her on the carpet at 1:30 a.m. and until 8 a.m. I didn’t leave her side. I began Christy’s healing sessions. I scanned her body with my hands and felt the clog of energy around her stomach and intestines. They were still in spasm. I began a meditation that I use for myself as well as my clients. Grounding myself and entering an Alpha level of concentration, I invoked my Higher Self, Christy’s Spirit Guide, the Pleiadian Emessaries of Light, Ascended Masters and only those entities that were for her highest good. Miraculously, a guide entered the room and knelt opposite me on the other side of Christy. That Guide was my father, Sam, who had past on fourteen years previously. Born March 20, 1914, died July 13, 1984. During his lifetime here on earth he was ill since he was thirty-four. He was stationed in France in WWII, where he was a cook for the largest battalions, as well as an interpreter for a Lieutenant since he was fluent in French. Many times on the front lines he never incurred as so much as a scratch in the war. Coming home at thirty-four must have been a shock to his system and stresses debilitated him. I was born and he went to work in the men’s haberdashery field as a window trimmer. A few months later he fell off a ladder, breaking a leg in a few places, and his life of surgeries began. At thirty-eight, he had his first of six massive heart attacks. In his forties came lung collapses, and in his sixties prostate cancer. 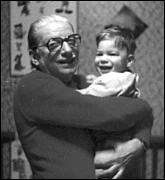 In 1980, my son was eighteen months old, and Poppy Sam had quadruple bypass surgery. His main healing factor was his grandson David. “Don’t let David forget me.” He lived until David was five. For six months out of every year my father was hospitalized for a surgery or illness. He had an enormous number of doctors, thoroughly knew his medications and was familiar with many kinds of tests. They say that in the universe we alternate lives. My father is now back among the Pleiadians, his original roots. He incarnated into his lifetime here on earth from the Pleiadian Emessaries of Light as did I to experience the world of traditional medicine. Poppy Sam has not left me as a healing guide since that time, and has been there again for Christy, for myself in my own journey back , and for Jingles. When my father first entered the room, I was so deep in meditation, I saw him through psychic vision with my eyes closed. I stayed calm recognizing him immediately. It was the first time we met since he passed over. I had been working with the Pleiadians for a few years then, and I know he was waiting for the right time. Channeled dialogue is not remembered because that is the intent of the message givers and I didn’t write down the dialogue at the time. I do recall the gist of the conversation, and my father told me his is one of my healing guides, as well as Christy’s spirit guide. He is also Jingle’s spirit guide, but we did not have her at that this time. He told me that Christy will be healed, and that I am on my life’s path now as a healer. I used the power of the sun’s rays to pull her aura in around her and to extend 1½ feet all round her in an egg shape. I pulled down a grounding cord from the sun, ran it through her crown chakra, down her spine, through the ground to the diamond at the center of the earth. Her aura was grayish, and not healthy looking. I did a complete chakra meditation with colors, starting at the root, and then crown, then heart, then throat, then solar plexus, and navel. When the energy was flowing, I used a white cloud to remove all of the sludge I found within her, and used Reiki to calm her and make the energy flow. Because she was too sensitive to crystals now, I didn’t use any at this time of her healing. I did psychic surgery to lift and untwist her intestines. As I worked the white cloud became grayish and I sent it out of the window up to the universe for transmutation. At other times during her healing I used a Magnified Healing Meditation, centered around the triple flame of the heart. During Christy’s healing my father’s hands were emanating white light and they were on top of mine, which increased my powers ten fold. I then brought up the ground cord via the same path and sent it out to the universe for transmutation with any residue the while cloud might have left behind. My father disappeared. At 8 a.m., still not being able to reach my regular Vet, we took Christy to one my friend recommended. He didn’t see any signs of twisted intestines, and what she might have had the night before could have been a stroke, and that we might have to put her to sleep. Nothing was further from the truth, as Christy was showing signs of alertness as she was eyeing the parrot in the office that kept exclaiming, “I love you! I love you!” He did a lot of blood work and we left to see our regular vet, who we had reached by then. By the time we got there, Christy was back to her regular self. Our Vet thoroughly understood the healing I did. He is a proponent of spiritual counseling and I met him through his wife who is a Reiki Master. He did feel some pull in the intestinal area but not enough now to be alarmed. He knew it was on its way to getting back to normal. On Monday I went to get Christy’s blood test results. No abnormalities were shown. In fact her blood tests were better than mine! I kept sending her healings through distant healing and touch for quite awhile after, and this traumatic illness has not reoccurred. October 2, 1990-May 16, 2004. Christy is now on her way to the Pleiades to meet Poppy Sam. She will always be remembered and loved. My wonderful vet and his staff sent their condolences for our loss with this heartwarming poem on the cover of the card. When a beloved pet dies, it goes to the Rainbow Bridge. It makes friends with other animals and frolics over rolling hills and peaceful lush meadows of green. Our pets do not thirst or hunger. The old and the sick are made young once more; the maimed and the ill become healed and strong. They are as healthy and playful as we remember them in days gone by. Though happy and content they still miss someone special, someone they had to leave behind. Together the animals chase and play, but the day comes when a pet suddenly stops and looks into the distance … bright eyes intent, eager body quivering. Suddenly recognizing you, your pet bounds quickly across the green fields and into your embrace. You celebrate in joyous reunion. You will never again separate. Happy tears and kisses are warm and plenty; your hands caress the face you missed. You look once more into the loving eyes of your pet and know you never really parted. You realize that though out of site, your love had been remembered. And now, you cross the Rainbow Bridge together.